MIAMI (Wednesday, February 22, 2017) — Miami-Dade County and the Miami-Dade Age-Friendly Initiative received a certificate today from AARP Florida accepting them into the Network of Age-Friendly Communities, a network of over 380 cities and communities around the world that are committed to promoting greater health, well-being, and quality of life for people of all ages. Miami-Dade County is home to the largest population of older adults age 60 and over in Florida, more than half a million, with that number expected to rise to over 800,000 by 2040. 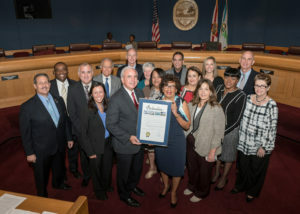 The Age-Friendly designation, presented this morning to Miami-Dade by the AARP in affiliation with the World Health Organization (WHO), makes Miami-Dade County the fifth largest community, and one of only a few counties, in the United States to join the global network. The Miami-Dade Age-Friendly Initiative is comprised of a diverse group of stakeholders, including executives from non-profit organizations, funding agencies, policy makers, academia, and personnel from key County departments. It seeks to enhance the Domains of Livability outlined by the WHO locally with a collective goal of creating a Miami-Dade where older adults can stay active, engaged, and healthy with dignity and enjoyment. These domains include: outdoor spaces and buildings, transportation, housing, social participation, respect and social inclusion, civic participation and employment, communication and information, community support and health services. Focused on building momentum, implementing strategies, and building awareness around the needs of our aging population, some of the Initiative’s accomplishments include: developing age-friendly parks standards; working with partners to make age-friendly changes to the County’s Comprehensive Development Master Plan and Miami-Dade Metropolitan Planning Organization’s Long Range Transportation Plan; empowering older adults in Little Havana to identify changes needed to improve safety within their neighborhood; drafting an Action Plan with community partners; and developing an awareness and educational campaign including a summit and workshops about the importance of focusing on the needs of older adults and making communities age-friendly. This designation empowers the work to go further as we connect Miami-Dade to a global network of like-minded communities who can share strategies, resources, and insight into making places livable for all ages. Now that Miami-Dade has officially been accepted into the network, the Initiative will kick off its next phase with a survey that will inform the expansion and finalization of an Action Plan for continued age-friendly efforts in the County. Learn more by following the Initiative on Twitter at @AgeFriendlyMIA or on the website at www.AgeFriendlyMiami.org or join the conversation with the hashtag #AgeFriendlyMiami. The Miami-Dade Age-Friendly Initiative is a collaborative effort with a collective goal of creating a Miami-Dade where older adults can stay active, engaged, and healthy with dignity and enjoyment. Today, the Initiative is led by a Leadership Committee and coordinating agencies that include: AARP Florida, the Alliance for Aging, Health Foundation of South Florida, Miami-Dade County, Miami-Dade Metropolitan Planning Organization, United Way of Miami-Dade, and Urban Health Partnerships. The Initiative is also comprised of an Advisory Committee made up of traditional and non-traditional stakeholders across multiple sectors who recognize the value and need for an age-friendly Miami-Dade. The AARP Network of Age-Friendly Communities is an affiliate of the World Health Organization’s Age-Friendly Cities and Communities Program, an international effort launched in 2006 to help cities prepare for rapid population aging and the parallel trend of urbanization. AARP became the United States affiliate in 2012. 145 communities (and counting), from Texas to Michigan, from Honolulu to Washington, D.C. — representing more than 61 million people, have joined the AARP Network of Age-Friendly Communities. The WHO Global Network of Age-friendly Cities and Communities began in 2006 and has grown to include cities and communities from 37 countries around the world, serving more than 130 million people. Other age-friendly communities have successfully researched, designated, and implemented intergenerational approaches to make life better for their residents, including enhancements like additional seating for older riders on public transit, housing for older residents located in close proximity to services and amenities, technology training sessions provided by younger residents for seniors, and training for family caregivers.